Cultivation Guides: Light, part 2 |Sundews Etc. This is part 2 of my Cultivation Guide on light, which is probably the most important factor in ensuring your plants are healthy and attractive. Part 1 focused on diagnosing whether your plants receive enough light, and what changes you can expect with higher light levels. This post will focus on the technical details of my own lighting setup, as well as some notes on cost and efficiency. Setting up indoor lights doesn't have to be exorbitantly expensive, but it will cost a bit in setup. My first set of lights cost about $150, including the cost of building the frame to mount the lights. Taking photos of lights is an exercise in futility. I use 2 of these Lithonia 3-bulb 4 foot T8 fluorescent light fixtures from Home Depot. As you can see, it is a hanging shop light, so you need something to hang it from. I built this frame out of inexpensive 1x4 and 2x4 lumber, plus a coat of stain to make it look nice. These shelves are great, and versatile. This was also a Home Depot purchase, and was about $100. It comes with 5 shelves, but I'm only using 3 right now (and only have lights on 2 of them). This is a sturdy, classic choice for a grow shelf. It's east to hang the lights (if you buy a couple of S-hooks) and each shelf is just the right size for 2 of my fixtures. The tubes I use have an output of around 2700 lumens, and my growing area is about 6 square feet under each set of lights. I use a mix of warm and cool bulbs, ranging between 3500 k and 6500 k. Most plants grown under these conditions seem very satisfied with the light conditions. The heat buildup hasn't been too much of an issue, although I think my living room could afford to have a bit more air circulation during the summer for my plants to be at their happiest. A lot of people want to know what lights to use. I've looked at T5 fluorescent bulbs as well as doing a bit of research into LEDs, and right now I'm firmly in the T8 bulb camp. As I mentioned in my post about the last BACPS meeting, current research suggests that T8s are more photosynthetically efficient per watt than broad-spectrum white light LEDs. I know this is a subject to a bit of controversy, so I'm not going to get too much deeper into that until Drew's paper is published next year. However, it's undeniable that fluorescent lighting is much more common than LEDs, and is cheaper and easier to set up for someone with no electrical knowledge. T5s are somewhat more efficient than T8s, but not by much (I would save maybe $20/year with high-output T5s), but the fixtures and bulbs are more expensive and harder to find than T8s. One thing to keep in mind about fluorescent lights is that the bulbs see a dropoff in output in a fairly short time period, and should be replaced every other year at least. 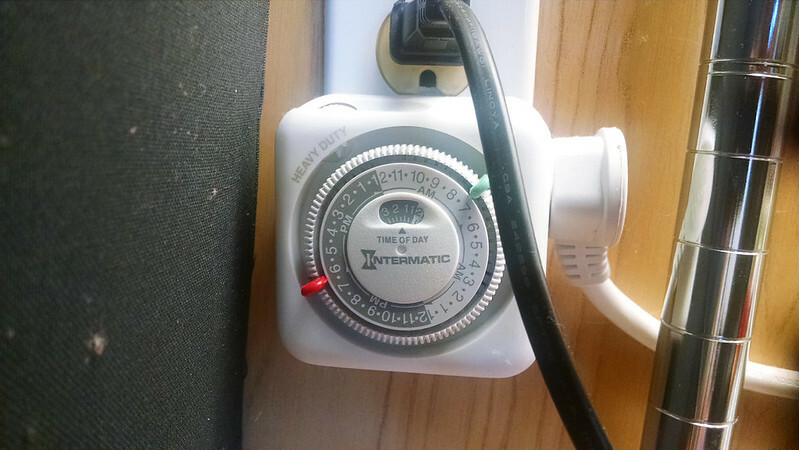 One thing you'll definitely need for your lights is a timer. Timers can get very sophisticated (and expensive) but that's not super necessary for most growers. These are available from Amazon and aren't too expensive. 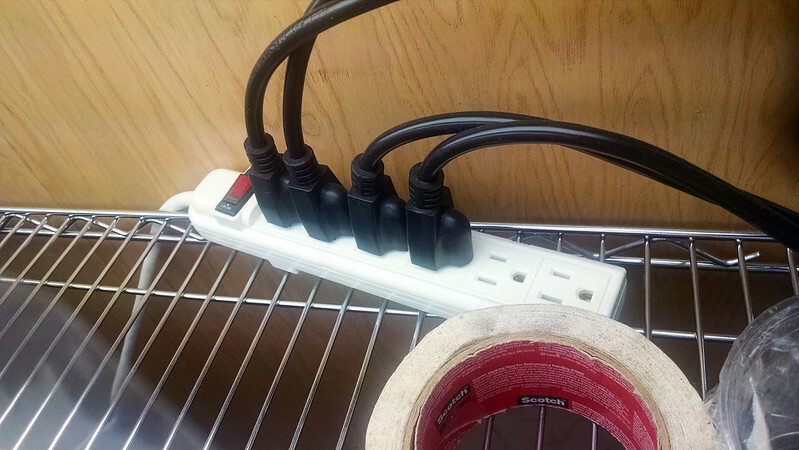 I hook mine up to a power strip and then plug the lights into that. The grow rack keeps everything in one place. I was giving the plants a 16 hour photoperiod, and recently dropped it down to about 11 hours (in 3 stages or so). 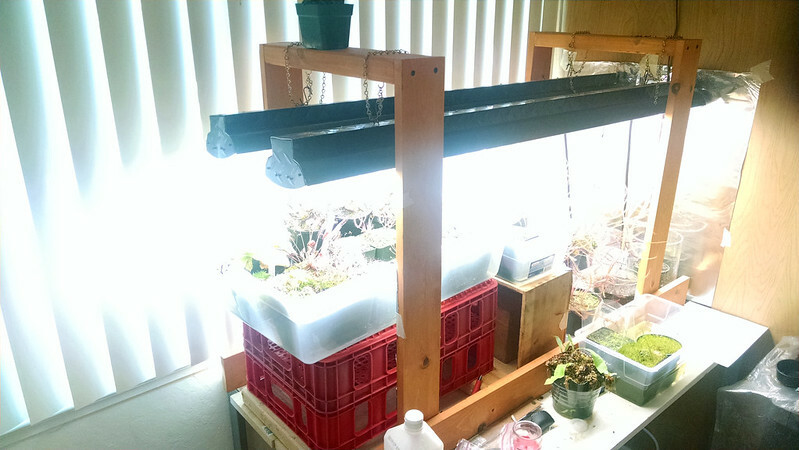 I'm not 100% sure this is necessary or beneficial – we'll see how my plants respond over the season, and then maybe next year I'll keep it much more constant. One thing the reduced photoperiod definitely accomplished was reduce some costs. 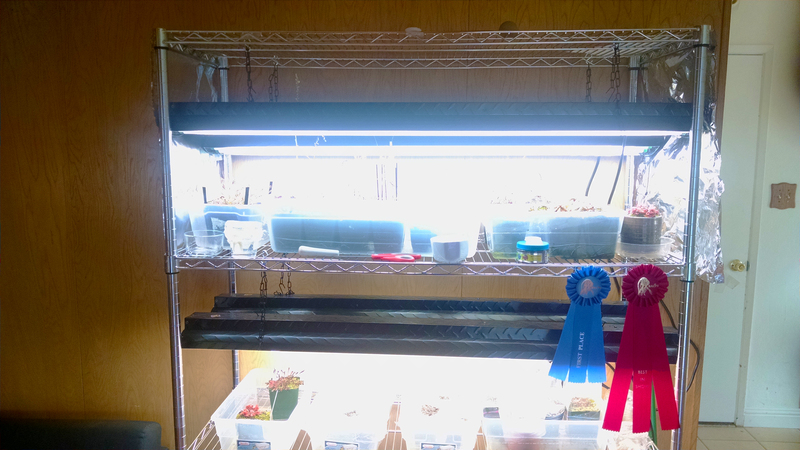 With a 16 hour photoperiod, running 18 tubes, I was using about 300 kW-h per month on my lights, which added about $50/mo to my electricity bill. Now with a 11 hour photoperiod that's down to a little over $30. Obviously this is a limiting factor in the number of plants I can grow. I don't really want to add another set of tubes at this time, so interested in building a protected space for outdoor growing soon. We'll see how that goes. One thing which can definitely improve the efficiency of your lighting (and possibly save money) is some reflective material around your lights. I don't use much – just a bit of foil on two sides of one of my growing areas – but it can definitely make less light go farther. Mylar is a better choice than aluminum foil. Remember though, that reflective siding reduces airflow and increases heat buildup, so factor that into your design. Growing under lights isn't for everyone. However, if you can't grow out in the sun (because of a lack of space, or because your climate isn't appropriate for some species) it is definitely preferable to a windowsill. It makes a huge difference in plant health, and is not too expensive with a moderately-sized collection. I'd love to hear what sort of lights other people use to keep their plants happy. 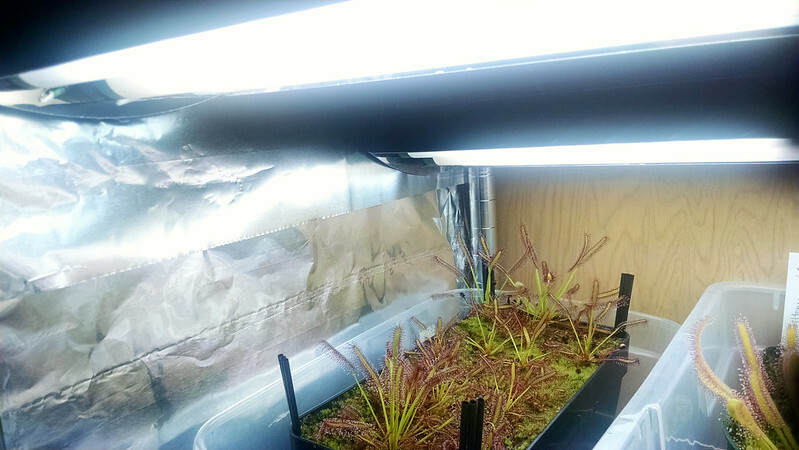 I use kessil h380's for my Drosera. They seem to love it. The lights are not to good for display though. The lights you were using for this setup were discontinued what do you recommend?